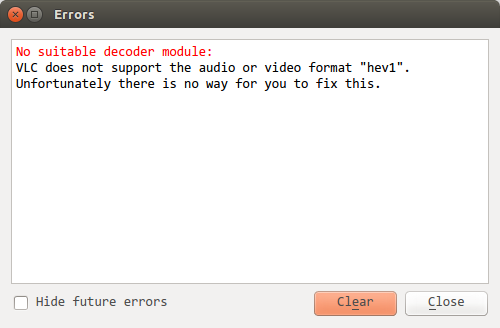 VLC does not support the audio or video format "hev1". That surprisingly pessimistic error message is wrong. hev1 is the HEVC/H.265 standard, which is a new video compression standard that is getting popular for high DPI content. All VLC needs is a decoder plugin for it. These video files should play correctly after installing this decoder. The VLC team shares two PPAs which can be used to get a more recent version of the program on Ubuntu. There seem to be lots of people experiencing this problem with the VLC 2.0 and 2.0.1 players. A lot of solutions are suggested on the VLC forums, but none of them solve this problem. A major feature that was added in VLC 2.x was multi-threaded decoding, which I suspect might be the culprit here. Finding no solution, I downgraded back to the last 1.x version: VLC 1.1.9 The Luggage. Video and audio plays fine with this version. I am sticking to it until this problem is fixed. Many videos come with a subtitles track, either embedded in the video container or as a separate file (typically a .srt file). Sometimes, these subtitles might be out of sync with the video. Syncing up the subtitles to the video is easy in VLC. Use the keyboard shortcuts h and g to either delay or forward the subtitles over the video. Each keypress changes the delay by 50 milliseconds and VLC displays the current delay value as an overlay on the video. There is another method, but surprisingly it does not work! Open the Tools → Track Synchronization dialog. Here, go to Synchronization → Advance of subtitles over video and set the delay to the amount you wish. This setting surprisingly has no effect! What works is only the keyboard shortcuts described above. When watching videos, sometimes you wish the volume were a bit higher than the maximum your computer can play. The problem is especially acute with videos whose audio is actually pretty low or with the underpowered speakers of most laptops. By default, VLC can already boost the volume upto 200%. But, what if you need your volume to be a big higher than that? It is possible to squeeze out a bit more volume, at the expense of audio quality. 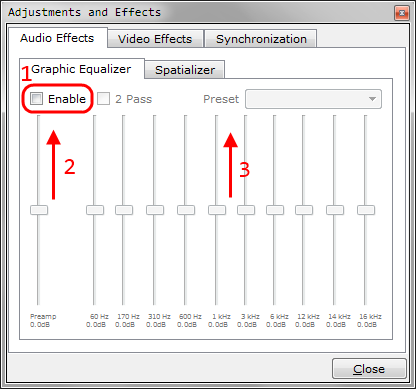 In VLC, choose Tools → Effects and Filters and in its Audio Effects tab you can see the Graphic Equalizer. Here you can get some volume boost by choosing to Enable it and dragging up the Preamp slider. You can get a further boost by dragging up all the individual sliders at the various frequencies. Sometimes the audio or video might lag behind the other during playback of a video file. Fixing this so that the audio and video are synchronized is pretty easy in VLC. Play the video file in VLC. Choose Tools → Track Synchronization. VLC pops up an Adjustments and Effects window with the Synchronization tab open. Increase or decrease the Advance of audio over video value until you feel the audio and video are in sync. It takes a couple of seconds for new settings to take effect. This is a per-session setting, as it should rightly be. So, it is lost when VLC is closed and reopened and needs to be set again if needed. VLC is the awesome-est media player which plays almost all the video formats out there. It is my default media player. 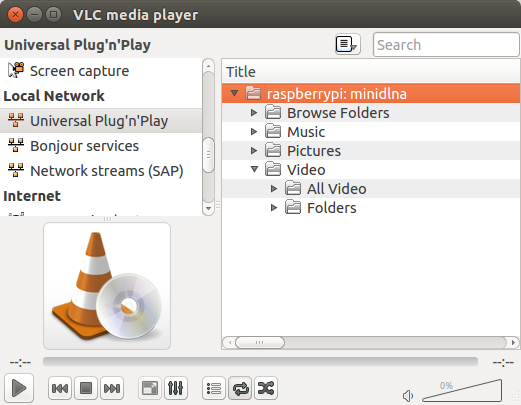 Sadly it cannot be my only media player, since it has partial support for Real Media files (.rm or .rmvb). This means that some Real media files play fine, some have seeking problems and some just do not play at all. Real Alternative Lite: Just the codec files. Real Alternative: The codec plus an old version of Media Player Classic to play the files. I like to have as few files around as possible. So, I prefer to install Real Alternative Lite and use Windows Media Player to play the files. Watching videos of talks, interviews and lectures often feels slow and long. You can speedup the video playback in VLC player by clicking the Faster button on the right side of the window. The speed of the video playback is displayed in the statusbar at the bottom of the window. Each press increases the playback speed by 0.5x. I find a speed of 1.5x the most comfortable to watch. If you need more fine-grained control, use the Faster (fine) and Slower (fine) options from the Playback menu. These change the playback speed by 0.1x. More: Peteris Krumins blogs about other ways to speedup video playback by using AviSynth and Mplayer. I find the VLC method the most simple and straightforward.